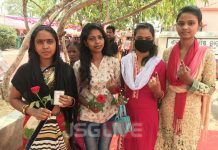 Jharsuguda : Several Lawyers of Jharsuguda Bar Association halted the Nomination for Urban Polls, started from Tuesday. However the Dist. Administration was fully prepared for the nomination and had placed their respective election officer in morning itself. But the Lawyers, had forced the election officer and asked vacate the premises of Municipality whee the nomination was to take place. Jharsuguda Bar President , Dinesh Kumar Jain along with several other lawyers shouted out slogans in Demand of the High Court Bench.